Horses spend a huge amount of their time on their feet, so it is vital to consider the surface they have underfoot. There may be little influence we can have over the grazing surfaces for turned out horses, other than providing good drainage and resting the paddocks, but we can of course control the flooring in their shelters, stall and stables. To help you decide on what is best for you and your horse, here are our top six stable floor solutions. One of the cheapest and most environmentally friendly flooring options is to use the existing soil surface as it promotes natural drainage and provides a warm soft base for your horse to stand on when stabled. The drawbacks to a soil stable flooring surface is that the area may become slippery if your horse is a heavy wetter and the surface can require daily maintenance, especially if your horse churns up his bed. Furthermore, the soil surface will need to be replaced regularly. Historically, wood was the standard flooring material of choice for equine shelters and stables, with benefits including a warm, forgiving surface for your horse to stand and lie on. Wood provides good drainage opportunities and is still regularly used today, but care must be taken to ensure that the stable flooring is treated to prevent rot from the ammonia rich urine. Wood floors are often lined with rubber matting to protect the surface from pawing ponies and promote easier cleaning. Considered to be perhaps the most beautiful stable flooring option, interlocking brick provides a traditional surface that will last for many years. This type of flooring has evolved over the years and now synthetic and rubber bricks are available to achieve the same attractive effect, but with non-slip properties and better drainage. Because of the time consuming methods of installing this stable flooring, interlocking brick is particularly expensive and probably best suited to smaller areas. Stabled horses can be more prone to ailments than there turned out counterparts, therefore, stable disinfection and cleanliness is paramount. 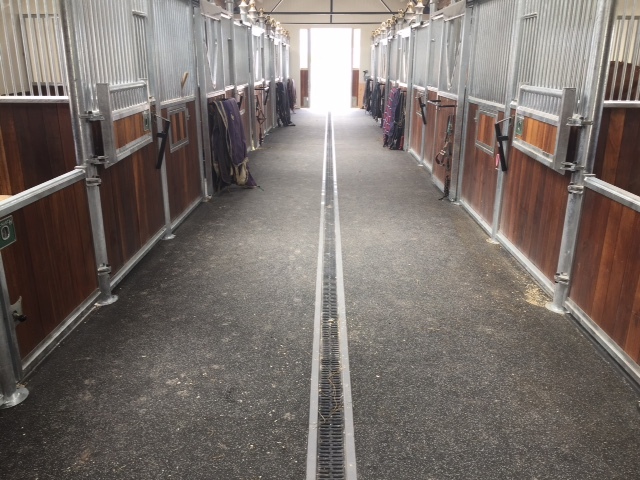 Concrete stable floors are extremely easy to clean and disinfect, which is a huge benefit to busy livery yards, studs and equine hospitals where occupants can vary from week to week. The hard surface of concrete can be quite unforgiving on a horse’s legs, particularly those who are stabled for long periods or who have tendon injuries, therefore a deep soft bed often accompanied by rubber matting will provide much needed cushioning for horses who have this stable flooring. This is a popular choice for large stable blocks as it is a little easier on horse’s legs than concrete and its quick drying properties allow the stable footprint to be laid in one go or can be laid in sections. Asphalt provides good draining and is aesthetically pleasing, however, its porous surface can be tricky to disinfect fully and so it perhaps best suited to privately owned yards. Rubber matting is a sought after flooring for stables and can be used as a standalone surface or in addition to a bed of shavings or straw to offer additional support and protection for the delicate hooves and tendons of your horse. Rubber matting is incredibly easy to install and clean, and also allows the more economic use of bedding thanks to its warm, soft cushioning properties, which will assist any good stable management routine.